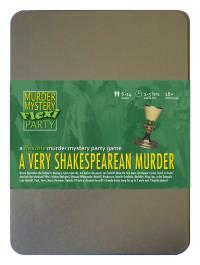 You've been invited to play the role of KING LEER in A Very Shakespearean Murder. What scream through yonder window breaks? Queen Derivative the Second is having a right royal ado, but before the guests can forketh down the first oxen, the Queen’s jester Yorick is found dead-ed! Join us to find out who-duneth-it! Time spent wandering lost and confused has separated you from your breeches and robes - but not your crown. What’s left is a bedraggled and torn tunic which hangs loose over your tights (you have also lost a shoe). You’ve been a king ever since you can remember and you’ve served with unwavering consistency: Show no mercy, act as judge and jury - and no skirts left unturned. Lately though, you’ve grown a bit bored of all that responsibility so you’ve split your lands across two of your three daughters (the third one wasn’t grateful enough). This in turn has seen you quickly dethroned and sent into a spiralling madness - at least, that’s what it looks like to people who didn’t know you before. King Leer, I humble at your service. Thank you for inviting me. I have but stumbled wildly, through woods afar and cliffs too near - ’tis time for me to grab a beer, and maybe more. Some speak of madness, I do too, but none such as that ruddy fool, Yorick. Alas, I knew him well, his gopher face and mud-like smell. Perhaps I blame-eth him for things, for his advice to once-were kings.